Recommended ways to get mana prisms and use them wisely in FGO(Fate/Grand Order). Learn more about Mana Prisms. Crystal created by concentrating mana. Mana is the magic energy filling the planet. 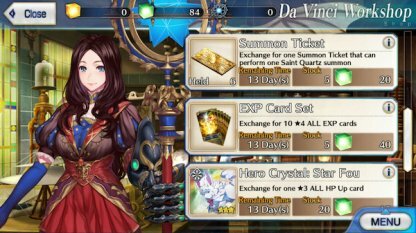 Use mana prisms to exchange for Summon Tickets, Fou and other limited edition items listed at Da Vinci Workshop. Stocks reset at 00:00 every month for most items. Do not forget to exchange monthly, since there are important items such as Summon Tickets that are used for summoning servants. 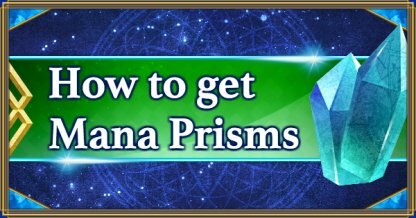 For the most part Mana Prisms are an item acquired from Exchange or as a reward. You can get as many as 500 of them by clearing one Event. Considering the amount of EXP 3★embers give you, using them for enhancement is not a good choice. There is also a risk to spend too many QP as well. So, just refer to 3★ember as another good way for gathering Mana Prisms other than farming on Events. As you might have already noticed, the amount of 3★embers dropped is larger on the Advanced difficulty. However, you may basically want to play on the Expert difficulty, unless you are going exclusively for embers. It is possible to collect Mana Prisms on Daily Quest. You can get 30 MAX. However, it is not a preferable way to farm Mana Prisms because of AP cost. You can aquire mana prisms by burning servants with 3 stars or above. Basically, the best would be burning a servant who has got NP level 5. Besides, you will get a rare prism when burning a 4★servant or higher. 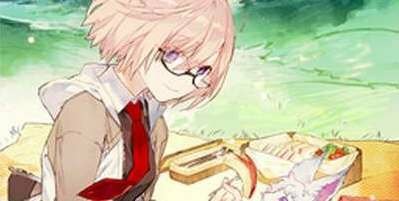 If your servant's NP is level 2, the amount of Mana Prisms and Rare Prisms acquired by burning doubles, if NP is level 3 - triples. And so on. When you have 700 Mana Prisms, you can exchange them for [Summon Ticket] and 2 types of [Fou]. As these items are worth the exchange, we recommend to exchange 700 Mana Prisms per month regularly. Even if you cannot obtain 700 mana prisms, try at least to get enough for [Fuo]. However, we do recommend to prioritize [Summon Ticket] if you were lucky to pick up a servant you wanted, for instance. Gives a servant +50 HP after Enhancement. By acquiring 20 of them from Exchange every month, you can increase HP of a servant by 990. Gives a servant +50 ATK after Enhancement. By acquiring 20 of them from Exchange every month, you can increase ATK of a servant by 990. Every ticket can be used to [Summon] once. Max number of tickets you can obtain every month is 5. You can obtain 10 4★Embers from exchanging once. Keep in mind that 40 3★Embers grant more EXP, but at the same time require more QP, which you probably do not want to waste so easily. You are able to exchange Mana Prisms for Limited Edition Craft Essences at Da Vinci's Workshop. There are not many Craft Essences with such an effect (Bond Points UP or QP UP). So, if you see a valuable one, you should definitely harry up to get it.